An exterior view of the Toothsome Chocolate Emporium & Savory Feast Kitchen, a 19th century steampunk-themed restaurant at Universal Orlando. © 2016 Universal Orlando Resort. All rights reserved. As the big summer season gets closer, exciting innovations will debut throughout the large park and resort industry. While these often involve thrilling rides and signature shows, parks are increasingly investing in immersive dining experiences too. In this installment, The Large Park Report explores the intersection of eating and entertainment at theme parks and resorts. Universal Orlando has long been lauded for its flagship theme park restaurant, Mythos. Located inside Islands of Adventure, this full-service destination has won numerous awards for theme park dining. A combination of interesting menu and immersive interior has made Mythos the type of restaurant you would want to visit regardless of whether it was located inside a theme park or not. So, it’s hardly surprising to see that Universal Orlando has tried to raise the bar even higher when it comes to themed dining with a new addition to its CityWalk entertainment district last fall. Known as The Toothsome Chocolate Emporium & Savory Feast Kitchen, this new dining option focuses as much on its storyline and design as it does on its well-reviewed food. Indeed, while it’s not uncommon to see heavily themed restaurants anymore, rarely does one come across a theme park restaurant where an entire storyline was created to explain the “why” behind the theme. Clearly, before you even enter the door, Universal wants the guest to be engaged in how this chocolate-centric establishment came to be. The creation of not just a “theme” but also a storyline with characters like the professor making it feel more like a theme park attraction than a restaurant. Indeed, it’s not hard to imagine the Toothsome theme could become the source material for a new show or even a ride at Universal Orlando based on the level of detail already created. As is often the case, when Disney or Universal serves up an innovation, the other quickly volleys back. For many years, Disney has worked closely with themed restaurant guru Steve Schussler in bringing immersive concepts like Rainforest Café, T-Rex, and Yak & Yeti. While these all centered on heavily-themed settings where guests to dined, they generally did not push a storyline and characters as part of the experience. The closest Disney had come to this “next level” of themed dining was the much-loved Adventurer’s Club at the former Pleasure Island with its band of merry Kungaloosh characters. Even so, that venue was still more adult lounge theater than actual restaurant. Recently, Disney has pivoted to celebrity-centric concepts that, while still heavily themed, are generally expansions or re-inventions of existing concepts. This has been especially true at the revamped Downtown Disney–now known as Disney Springs. Chef-driven concepts there include Chef Art Smith’s Homecomin’, Morimoto Asia, STK Orlando, and Guy Fieri’s re-boot of the Planet Hollywood Observatory. Another highly-anticipated redux is The Edison, opening at Disney Springs this summer. This Patina Group-operated concept follows the original Los Angeles version which features early American electric-age theming along with eclectic entertainment ranging from contortionists to a palm reader. All this is within an industrial-chic themed environment that Thomas Edison himself may not have remembered but certainly would have found eye-catching. 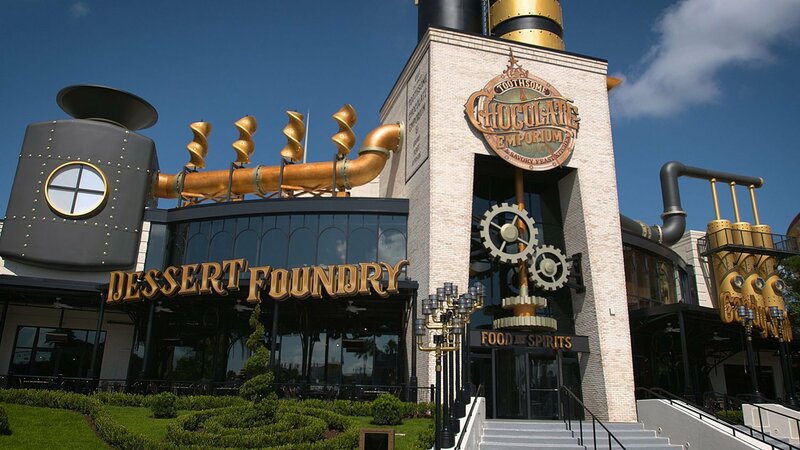 The distinction between Universal’s Toothsome Chocolate Emporium and The Edison is very interesting and may provide insight into the two large parks and their themed dining strategy. For instance, both include heavy theming in the décor as well as the in-restaurant entertainment and menu offerings. Both also have a steampunk and retro feel that offers an eye-catching glimpse into a past that never was. They offer a mix between fantasy and reality in a fun form of alternative history. 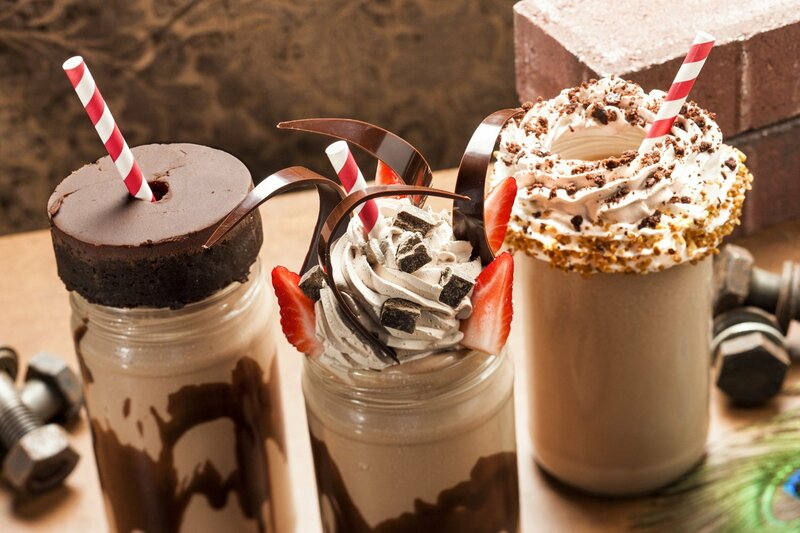 Desserts from The Toothsome Chocolate Emporium & Savory Feast Kitchen at Universal Orlando. The restaurant has a strong storyline and menu. © 2016 Universal Orlando Resort. All rights reserved. Where they deviate is Universal’s decision to create a concept from scratch versus Disney’s decision to partner with a third-party operator to expand on an existing concept. Each present pros and cons with Universal’s challenge being how the public will respond to a previously “unknown” storyline and Disney’s being how interesting and compelling the public will find a derivative (albeit with major new elements) concept. These approaches can also translate to other amusement facilities as you evaluate themed dining. Creating a concept from scratch and operating in-house can be more expensive and risky but, if it is successful, you own the intellectual property and you reap all the rewards. At the same time, partnering with a third party on an existing theme spreads risk beyond yourself and may allow you to tap into existing customers who already know the concept and are more likely to try it because of that familiarity. Regardless of your approach, it’s clear from the industry’s two largest park operators that the distinction between entertainment and eating is becoming more blurred as most new in-park restaurants build on immersive themes rather than just focus on a type of food.